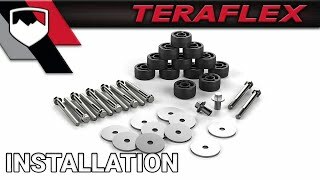 The TeraFlex JK/JKU: 1.25” Body Lift Kit is perfect for the budget-minded enthusiast wanting a simple lift to clear larger tires without altering the vehicle’s center-of-gravity. Combine the 1.25” Body Lift Kit with one of our Performance Spacer, Coil Spring, or Suspension System lift kits for additional clearance. Molded from UHMW polyethylene for longevity and corrosion resistance. This easy-to-install bolt-on kit doesn’t require grinding, cutting, or repurposing of factory hardware. No grille removal required. • Works w/ automatic transmissions only. JK/JKU models equipped w/ a manual transmission will require shifter boot trimming for proper installation. • Works w/ original or stock-length aftermarket shock absorbers – we recommend Falcon Performance Shocks or TeraFlex 9550 VSS Twin-Tube Shocks. Great lift for a low price. It adds just enough body lift to make a visible difference without changing handling or functionality. It was fairly easy to install and there is no real up keep. I check the torque on the body bolts once in a while, but have yet to find them loose at all. Another great Teraflex product.